This Performance Toolkit, designed with our Learning Cooperative partners for a major financial services firm, enables business unit subject matter experts and others to develop training programs for the employees without having to work with a professional instructional designer. Client Problem/Need: Due to staffing changes, our client needed a way to transfer professional expertise from instructional designers to line areas, to enable subject matter experts to develop their own training. Our Approach: C/R Solutions, along with its Learning Cooperative associates, focused on providing tools and instruction that business unit employees, with little or no professional training experience, could use to design and deliver effective learning programs. Our Delivered Solution: We integrated learning resources (including tools, templates, examples, worksheets, checklists) with a proven instructional design model into a Performance Toolkit that delivers both to the user at the precise point at which they need them. Benefits Achieved: Subject matter experts and others from the line areas have become much more self-sufficient in designing, developing, and delivering training to their colleagues. The Training Department staff can now assume a more consultative role, thus widening their reach and impact on the organization as a whole. 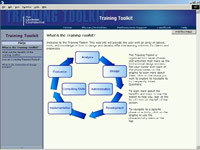 This Training Toolkit was designed for the Technology Group of a major financial services firm that to learn a new software development process. Client Problem/Need: The Technology Group was rolling out a standardized methodology (Microsoft Solutions Framework) for 7000 software developers across the entire organization. The methodology required the technology areas in all business units to make significant changes in their current roles and processes. It also required that all groups employ one process and one set of artifacts for reporting. Our Approach: C/R Solutions chose to focus on ensuring effective, ongoing performance, rather than merely provide one-time, up-front training. That meant starting from the required work flow, assembling and utilizing all of the relevant and required tools and artifacts for each role and each business unit, by process phase, and providing the knowledge/instructions necessary for the completion of each task. An initial learning program was also developed to provide the prerequisite background information on the new process. Our Delivered Solution: We developed a two-stage learning/support toolkit. Stage One (Foundation) blended web-based, self-paced training and asynchronous learning broadcasts to introduce employees to the core concepts and the changes the new process would require. For Stage Two (Immersion) we delivered instruction for each role in the process in a web-based performance toolkit, sequenced by the work flow phases. As the program guided employees through each of their tasks, it provided both the knowledge and the resources (tools, templates, artifacts, white papers) they needed to complete them. Employees could access and work with the artifacts unique to their unit. Benefits Achieved: Rollout was possible in half the time that would have been required by other methodologies and at a fraction of the cost. Employees received not only effective training but an ongoing knowledge base of best practices and tools to refer to while completing their tasks on the job. Existing resources were levereged extensively. The same toolkit provided both initial training and on-the-job learning and reference, thereby reducing the need for separate documentation. This project was designed for a major retailer of sails and equipment for recreational yachtsmen. Client Problem/Need: The client required a way to help recreational off-shore yacht racers and cruisers apply weather-routing strategies to their sailing objectives. Although reference materials and general training about weather and meteorology are widely available, none allows sailors to apply the knowledge to such specific sailing goals as wining a race or increasing the margin of safety in an offshore cruise. Our Approach: C/R Solutions chose to focus on performance outcomes rather than conceptual understanding. We worked with one of the world's premiere "weather routers" to reverse engineer the process he uses to prepare and advise his clients on using weather information to meet their strategic goals. Unlike a more traditional “knowledge base,” this approach organizes the knowledge based on actual workflow and enabled us to document fully this esoteric and highly specialized process for the first time. Our Delivered Solution: To complement and support a one-day Weather for Sailors course that reviewed the concepts of meteorology that apply specifically to sailing, we designed a web-based Weather Routing Toolkit that guides sailors through each of the steps required to find, gather and interpret weather data, and then to apply that knowledge to specific sailing objectives. Benefits Achieved: Sailors have reported that the Weather Routing Toolkit has allowed them to reduce substantially the amount of time and effort required to identify specific weather data, obtain that data (usually through the internet), and understand what those data mean (for example, reading a complex weather fax or infra-red satellite image).